Most of us know what are favorite Thai dishes are as far as meals are concerned, however how many of you have explored the desserts that Thai culture has to offer? Thai desserts are not light fare as most dessert in other cultures tend to be. 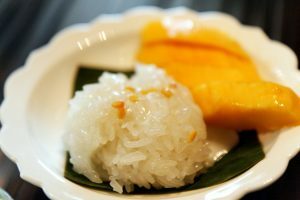 Instead Thai desserts are very sweet and filling using mostly coconut cream, tropical fruit, sweet syrups and yes…sticky white rice! When it comes to the sweet after dinner treat or perhaps just satisfying that sweet tooth there are a few Thai desserts that I believe are a must try. Especially so that you are able to fully experience what dessert in the country of Thailand is really like. I’ve put together my top 5 favorite Thai desserts and what they are comprised of. Explore the sweet side of Thai and get ready for incredible flavor combinations as well as some new ingredients you may just discover. Khao Neow Toorien- This is a delicious coconut cream soup filled with sticky rice and a chunk of Durian. What exactly is Durian? It is a tree fruit that has a smell you hate to love. Not a meet in the middle flavor, it is often said that you either dislike durian or you absolutely love it. Needless to say mix it in this sweet filling dessert and you have yourself perhaps one of the best Thai desserts that can be found. Khanom Gluay- This dessert many refer to as the green goodness because of its traditional green color. Sound a little funky? The taste though will have you changing your mind. 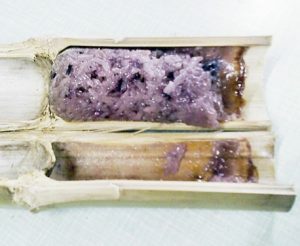 We start with sticky rice, add bananas, sugar, and shredded coconut. Next by soaking Pandanus leaves in cool water and adding it to the rest of the ingredients we have our green hued treat. The Pandanus leaves are solely for color and make this dessert distinctive. Khanom Jark- This delicious creation is minus the sticky rice. Comprised of a few basic ingredients such as flour, sugar, salt and coconut meat we then wrap this in a palm leaf and grill it! A little more simple and less filling than most of our desserts, it still is one of my favorite to enjoy. Khao Lam- I enjoy this Thai treat because of it’s unique preparation style. First we take a bamboo pole and stuff it with sticky rice and black beans that have been sweetened with a thick coconut syrup. Next we roast the bamboo stuffed poles over a low fire. 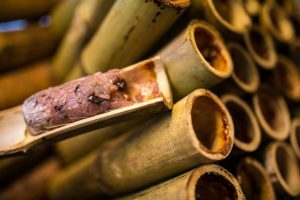 Once they have been roasted long enough we use a strong knife to cut open the bamboo where the sticky sweet creation is ready to be served and eaten. Khao Tom Mud- Again this is possibly one of my very favorites because of the banana leaf and sweet candied filling. First we start with more of that sticky rice we are so fond of. Next we add black beans and then candy it with coconut milk and sugar to make a heavenly filling. We then wrap it in the banana leaf and it is ready to be served. These are just 5 of my favorite Thai desserts but there are definitely many more to be tried. Although traditional Thai ingredients used in desserts are a bit different then a lot of western style desserts, they are still a force to be reckoned with. Next time you have a sweet tooth or maybe just a little inkling for something sweet and tasty, stop in to Siam Cabin Cuisine and try one of our house made delicious Thai desserts. We promise you won’t walk away unsatisfied. We are excited to announce we have wonderful changes coming to our restaurant patio to enhance your dining experience. Although the renovations will stray away from a more traditional Thai decor, we are looking forward to the contemporary open aired atmosphere it will bring to Siam Cabin Cuisine. By updating our current patio space we will allow for plush, lounge worthy furniture. Not only will our guests be able to enjoy exquisite table top dining, but you may now also come to relax and have one of our refreshing cocktails or other beverages, while sitting next to a fire pit and enjoying some traditional Thai starters. How are we creating this vision? We have aligned our good friend that owns a spectacular garage door company, garagedoorrepairaz.org. We will will be adding a garage door as a connector to our dining room! ! Dan our go to guy at Ahwatukee Garage Doors, has provided us with a beautiful new door and will be installing it and its opening system in the next coming days. Being the Thai food fanatic he is and with a genuine friendly demeanor, he has already told us he will work for food! Our passion is healthy and incredible Thai food, so we think it’s a pretty sweet deal! In all realness Dan is just an awesome small business owner that would like to see another small business succeed. He’s a reputable, trustworthy guy, with affordable prices and awesome work, so if any of you other Thai food enthusiasts have something to trade (preferably great food…shh we didn’t tell you that) give Dan a call! What exactly will the garage door serve as?? This new garage door will not only open up the dining space, we feel it will also define our patio and give it a more modern look. Who doesn’t love enjoying delicious fare and craft cocktails with those close to us on a great patio!? We know we do!! The versatility of this renovation will be great for the changing seasons as well. We can open the garage door automatically to allow fresh air into the restaurant on those nice breezy summer and spring nights, as well as keep it closed in the colder months allowing an outdoors feel for those who sit out side, nestled in our new patio furniture enjoying those fire pits. Although the end results will be stunning, we ask that you bear with us during the construction. We will still be open regular business hours and will offer our indoor dining, however the patio will be closed for the next coming weeks. We have amazing new dishes we will be implementing with our menu over the next few weeks to come and would love your feedback on any new items tried. We are currently in the works of adding to our existing menu items to coincide with our new look. With our new patio, and enhanced atmosphere we would like to add a few more options for all spectrums of palates to enjoy. Once our new patio is finished we hope to roll out with the added menu items as well. We hope that you are as excited as we are for these new upgrades, we will be posting updates as the renovation continues here on our website. Please check back as well to see the delicious specials that will be available or just come visit us and satisfy your appetites! Like we mentioned earlier, the thai culture plays a big role in the style of food they produce, and how they eat it. Thai dishes are characterized by their balanced flavor profiles and great combination of sweet, spicy, salty, sour, and bitter flavors. Many traditional dishes have become national favorites in the state and can be found in almost any town nationwide. American’s have come to love thai food, especially the popular pad thai, tom yam kung, and curry dishes. Although you do have many choices for authentic thai food around the country, we do believe their is nothing like the authentic cooking of Siam Cabin Cuisine. For those still curious to learn more about the culture of the thai people and not just the food, read on. The thai culture believes rice is sacred, and because of that they never waste it and leave uneaten rice on their plate. Additionally they do not step on rice in the fields and believe rice has a divine god inside it. Also, because of their climate and typography rices grows extremely well, and is their largest export and they are the largest producer of rice in the world. Most thai homes do not have an oven, and baking is not a common practice what so ever in Thailand. Seems weird to most Americans, because of our obsession with baked goods, but the thai people have gotten along just fine without them. Eating is considered a celebration, and why thai entrees are designed to be enjoyed in groups and shared between individuals. Eating alone is not common practice, and even believed to be bad luck by some. There is no difference in the type of food thai people eat for breakfast, lunch or dinner, like their is in the States. They simply eat a similar style of food at three different points in the day. Traditionally beer is poured over ice in Thailand. So don’t be surprised if your beer is served with a glass of ice. Hopefully you feel a little more knowledgable about the thai culture and what makes thai food so unique and good!